The winter months have turned into something like an off season for me. This doesn’t mean I do any less training though, on the contrary the winter months are filled with masses of endurance training to last me through the rest of the year. This does mean I race less though, which is a welcome break for the mind and gives me a chance to simply enjoy exercising for the right reasons, not simply to be good at racing. There are however some opportunities that simply can’t be passed up. The Quebec ITU World Cup Winter Triathlon was one of those. A mixture of sports I’m not familiar with racing, this would be a great opportunity to try something new and challenge myself in a different way. The race starts with snowshoeing, which was set to be my strongest discipline as it has many similarities to running and would require the least specialist technique. Snowshoes had to be of a certain size but apart from this anything seemed to go. I had a more traditional snowshoe but some people seemed to have things that looked like an elongated plastic Frisbee bolted to a standard road trainer. Next is speed ice skating. Having played hockey for many years I knew I could skate but speed skating is a totally different kettle of fish. Changing into speed skates would waste valuable time, most competitors therefore change into their cross-country ski boots and clip a Nordic ice blade to the bottom! This means the blade is only attached at the front allowing it to swing down when you take your foot of the ice – takes some getting used to. Lastly is cross-country skiing, I have been skiing a little for the past 5 years but mainly classic style – this looks similar to running where you stay in the tracks made by a machine. In order to do well at this race though I would need to skate – which is where you move along with your skis in a ‘V’ shape gliding on one then the other – of which I have only been attempting for the past year now. 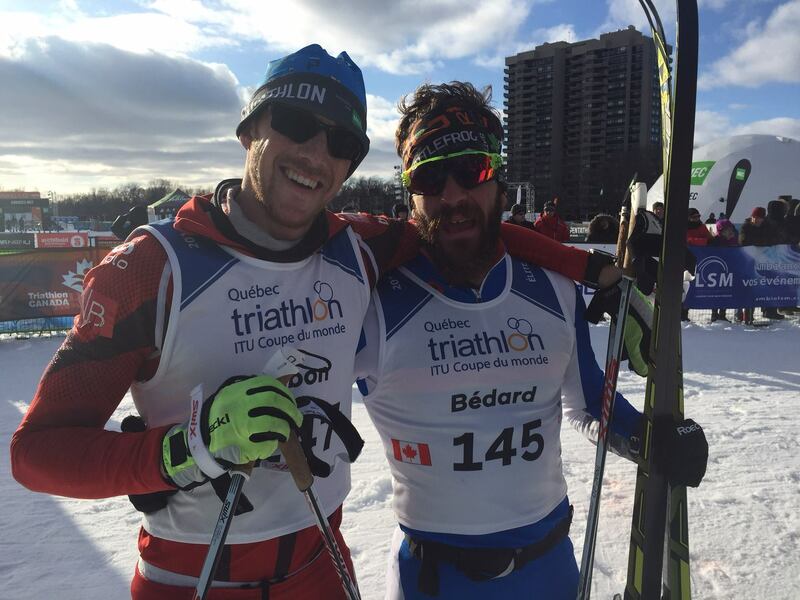 The distances would be as follows: 5km snowshoes (3 laps), 11km speed skate (30 laps), 9.5km ski (3 laps). 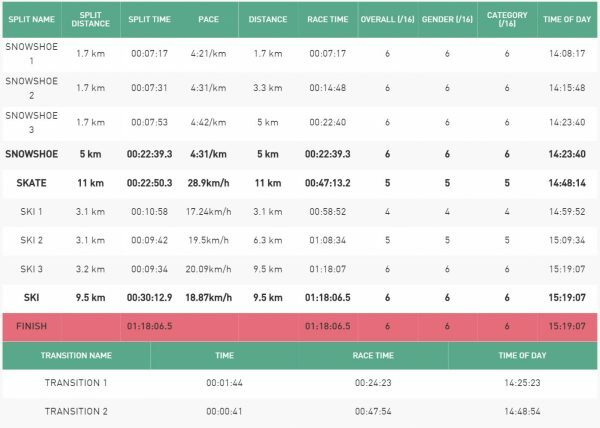 With these race distances the winning time was set to be around 1hr 10minutes and the maximum time allowed 1hr 30minutes. So with the odds stacked against me it did cross my mind as to why I was starting with a World Cup event. Other athletes included Olympic Biathletes and World Champion Snowshoers but most importantly people that had grown up with winter sports…not those that grew up in Essex. The snowshoeing started fast. I soon realised that the track was mostly single and to overtake takes a massive effort in some deep snow. This means most people try to get away quickly so as not be held up. Caught on the back foot I was sitting in 8th out of the 15 competitors. 8th! In what was meant to be my strongest discipline! It was therefore not long before I started to try and move my way up. Making it into 4th or 5th, I was now content. However, the added effort had gutted me and I was out of touch with the rest. Never liking to start a race so hard and having not raced in a few months I wasn’t liking the prospect of feeling like I was for the rest. Thankfully the ice skating provided some respite. It turns out the speed skating is majorly about technique and drafting. The action and position you are in makes it difficult to raise your heartrate so high, allowing a well needed recovery. The pain that takes over though is in your lower back from being so bent over and right thigh form continually turning left on the 400m track. Games of cat and mouse seemed to emerge with competitors attempting to form trains and draft each other. I managed to get a tow behind a Slovakian for a lap or two before he pulled up allowing me through, I was then largely alone either overtaking or being overtaken for the rest of the time. 30 laps is a lot and leaves it near impossible to workout which position you have. Thankful to see 30 next to my name on the board signalling I was on my last lap I allowed myself a brief moment to straighten up; it felt as if someone had been punching my lower back for the last 20minutes. The fun was just beginning though because if I thought skating on skis was hard before, doing it after speed skating was going to prove interesting. Surprisingly I exited the rink in about the same position as I got on, joint 4th/5th. Even more surprisingly still was as we put our skis on I overtook him and didn’t look back. This is about when I forgot about the race though and had to concentrate on staying upright. Due to some adverse weather the snow conditions were the worst I had ever experienced, ranging from slushy puddles (super slow) to frozen slushy puddles (super fast). Concentration was at an all-time high. Somewhat thankfully, I was given a 15second time penalty for not putting my snowshoes in my plastic tub in transition. As I served the penalty after one lap of skiing I had the opportunity to try and relax and focus, I had to forget about trying hard and instead concentrate on my technique. Still in 4th I knew it wouldn’t be long before a few good skiers would catch me. The first was Marco Bedard, I was actually thankful to see him and wished him luck in catching the leaders. One more was bearing down on me and, lacking fighting spirit, I let him go. I was now nearing the end and turning the last bend I was down the final straight. Seeing Marco standing at the finish line I smiled and absorbed the moment… a little too much as it happened, I neglected to concentrate on skiing and tumbled to the ground just 5m before the finish line! Finishing in true British style I was done and had placed 6th in the elite field, a position I was more than happy with. I can’t thank Marco Bedard and Claude Godbout enough for making the trip possible for me, from hosting me to giving me last minute technique advise to feeding me copious amounts of maple syrup they truly made the trip unforgettable. As a fellow (British) Essex guy I loved the report and am also apprehensive about doing the same race in a month. Thank you (despite being nearly 2 years ago). A question – what is the condition of the ice like? Is it as good as an indoor rink or more like a natural lake? I am debating whether to get nordic blades and this may sway me.